Most reading for the purpose of taking in information is remedial — don’tcha think? After all, if you already know a subject, why read about it again? So why do they publish new biographies of Washington and Lincoln, guys we all learned about in grade school, that are written for and sold mostly to adults? Is it because we never heard of them? Or because we need to know more? For several years my personal reading has slanted heavily toward a great deal of material about United States history, cruising along in a sequence that has been informed by my provoked curiosity. In the process I’ve filled in gaps — chasms, really — in my knowledge base, coming to understand important events and personages from this nation’s history that I should have absorbed long ago, but — well, I didn’t, so what can I say? But now I’m not so much of an ignoramus as I was formerly. Happily convenient to my reading program has been the availability of two recent one-volume biographies, one each about George Washington and Abraham Lincoln, which I read one after the other. Somehow, in my nearly sixty-eight years of life I had missed studying much about either one. It’s true that I was forced to read a biography of George Washington in eighth grade and write a book report on it, but all I remembered from the experience was that Washington didn’t chop down a cherry tree and confess it to his father when confronted — but was nonetheless exemplary as an honest man of integrity; and he didn’t throw a silver dollar across the Potomac, which would have been a waste of money — but he once demonstrated arm strength that suggests he likely would have been able to nail a runner at home plate from the center field fence in Huston’s Minute Maid Park with one throw. All of which is more than I knew about Abraham Lincoln. Washington: A Life by Ron Chernow is more than merely informative. As a recent recipient of a Pulitzer Prize (shortly after I finished reading it), it’s been recognized by highfalutin types inclined to give awards for that sort of thing as being an outstanding piece of historical writing. I would be ill-equipped to disagree. The reputation of George Washington the man needs no more approbation from me than it has already received from history. (Whoever that is.) Let us make allowance for his being a leading rebel against the established order of his time; a slaveowner; a presider over hangings; and the hands-on leader of masses of men engaged in wholesale slaughter, whose personal engagement and ferocity makes John Rambo look like a girlie man. If we acknowledge these realities as acceptable behavior for the time and circumstances under which Washington lived, then added to all the other things he accomplished it would be hard to deny that Washington was one of the most notable and highly accomplished men in world history. 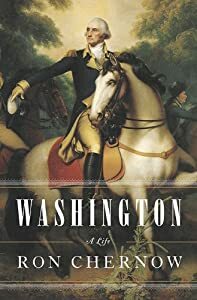 My experience reading Chernow’s account of Washington’s life acquired the properties of a daily lesson. Each morning when I arose, my thoughts soon became fixed on sitting down to devour the next installment. And I didn’t hurry through it, but picked at it in swallows of ten to twenty pages per sitting. When I finished I felt I had been truly enlightened about an important person to whom I had formerly paid little attention. I’m glad I bought a copy of this book for myself rather than checking it out of the library, because I’m sure I’ll never remember it all. There are just as many biographies of Abraham Lincoln, some of them massive, some very old, and many highly specialized. (Books on Lincoln’s early formative years, books focusing on Lincoln’s two years as a US Congressman, books on his famous debates with Stephen Douglas, and so forth.) For more than a year I searched for a relatively recent one-volume general biography targeted at intelligent adult lay readers (not historians), and had concluded there isn’t one, when one day, during the time I was reading Chernow’s book on Washington, I was in Bexley Library and just happened to stumble across A. Lincoln: A Biography by Ronald C. White Jr. on a display stand. It took less than ten seconds of thumbing through it to conclude it was exactly what I had been looking for. The writing of A. Lincoln, while fascinating, never boring, and certainly accurate, seems less inspired than Chernow’s account of Washington. Perhaps if I had not read them one after the other I would be more lavish with my praise for it, since I can’t really cite any of its faults. Well, maybe one. Mr. White opted to end the book quite abruptly, barely two pages following the death of Lincoln by assassination. We must assume that doing so was the result of a conscious decision on the part of White, no doubt based on the proposition that as a story of the life of Lincoln there was no need to tell more of the tale after he died. 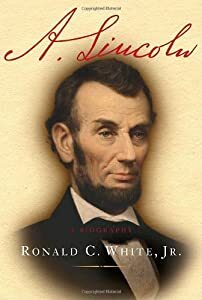 However, typical of most biographies, White dwells in some detail on what is known about Lincoln’s parents and other ancestors in order to set the stage for establishing his life as a self-made, hard-working, poor country boy. This information is welcome, but I imagine that even as famous an event as Lincoln’s assassination is, and having just completed a whole book about Lincoln so as to become attached to the man, most readers will have questions they would have liked to see addressed from the author’s viewpoint, such as: a summary of what became of John Wilkes Booth and his co-conspirators, still sufficiently interesting that there’s a current movie about it; and with the Civil War freshly over, and freshly inaugurated for a second term as president, what role may Abraham Lincoln have been able to play in giving direction to the coming Reconstruction period? Surely his input would have been more productive than the controversial machinations of Andrew Johnson, who barely escaped being thrown out of office on his keister. At 436 feet, Minute Maid Park is currently the longest yard in the major leagues. This entry was posted in Re: Views and tagged Abraham Lincoln, George Washington, Ron Chernow, Washington: A Life. Bookmark the permalink.